Lisa has been teaching First Grade at St. Cletus since 2003. 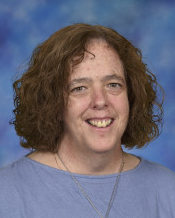 She has an Associate Degree from the College of DuPage in Early Childhood Education, a Bachelor’s Degree in Communications from Concordia University and Master’s in Education also from Concordia. Her Aunt Rita Woods was a teacher when St. Cletus first opened its doors and is proud to hear that she had been hired and follow her footsteps.